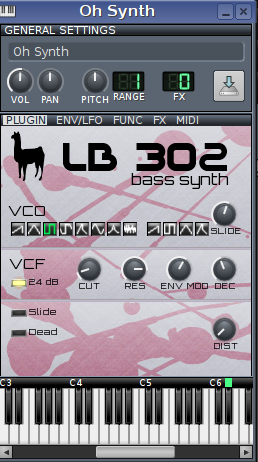 LB-302 is a virtual monophonic bass synth modeled roughly after the famous Roland TB-303 Bassline synth. LB-302 is part of the bundle of synths that are currently available in Linux Multi-Media Studio (LMMS). Just click the "Instrument plugins" tab (the first little box on the left side of the screen, below the Project menu selector) and drag the "LB-302" icon into the Song Editor section. LB-302 has a single oscillator, with the following interesting variety waveform options: saw, triangle, square, rounded square, moog-like, sine, exponential, white noise; and the following band-limited waveforms: saw, square, triangle, moog-type saw. The Main Page's general settings section includes global volume, panning and pitch bend settings. LB-302 does not include traditional ADSR envelopes, and there is also no LFO modulation provided. However, it does include some settings that provide enjoyable sonic control, such as portamento (slide, both on-off and knob for duration), a 24-dB VCF on-off switch, a "dead" switch and a distortion knob for added roughness. There is also a filter frequency knob and a filter resonance knob, an "Env Mod" knob to adjust filter depth, and a "Decay" knob to control filter decay. The last audio sample above demonstrates various filter settings (frequency-resonance) using the band-limited saw wave and 24-dB VCF. As with the other synths in LMMS, LB-302 also includes pages for arpeggiation, an effects chain and midi management.